When “Connecting the Dots: Labor and the Digital Landscape” went to press at LABOR (15:3), the wave of union organizing and activism in the media industry was just gaining ground. The initial foray came in 2015 at Gawker Media Group, where workers joined forces with the Writers’ Guild of America East (WGAE). Writers at Vice Media, The Huffington Post, and Salon then followed suit by joining up with the WGAE. The NewsGuild (once known as the Newspaper Guild) found success at the online arm of the Guardian. When a re-incarnated Tribune Company known as Tronc seemed bent on a digitally driven “disruption” of the newsroom of the Los Angeles Times, staffers at the historically union-unfriendly newspaper voted to join up at the NewsGuild. The union, LA Times journalists said, would protect not only their livelihoods but the paper’s legacy of important journalism. More recently, WGAE has organized workers at Vox Media, MTVNews, the popular satirical site The Onion, and the food and entertainment site Thrillist. For staffers at Thrillist, a one-day walkout and a strike authorization vote in August 2018 led to a solid first contract last month. WGAE has also brought in video production workers at Vice Media and editorial staff at The Intercept, the investigative reporting site founded by Glenn Greenwald, Laura Poitras, and Jeremy Scahill. Staff at the legal news website Law36o organized with the NewsGuild in 2016, and this past October members of the unit also voted to strike if management continued to stall in negotiations over their first contract. Editorial workers at The New Republic and the online media company Mic.com voted overwhelmingly to join the NewsGuild in the Spring of 2018. Perhaps inspired by the organizing success at the Los Angeles Times against shared corporate overseers, the newsroom workers of Chicago Tribune rallied to the NewsGuild; in early May, Tronc voluntarily recognized the new union. In the meantime, after the Tronc installed publisher at the Los Angeles Times resisted the unionization efforts (in vain as it turned out) and then was buffeted by allegations of sexual misconduct, Tronc agreed to sell the paper to a local billionaire, a deal consummated in June 2018. The move brought optimism in the newsroom, not least because it signaled temporary stability after years of being roiled by a distant conglomerate more interested in extracting profit than investing in journalism. Just as important, the Guild unit at the Los Angeles Times has been vocal about the importance of competitive pay, equity on the job, and investment in groundbreaking reporting as the transition shakes out. And last but not least on the organizing front, the editors, fact checkers, designers, and social media strategists at the New Yorker have laid claim to the adage that one can’t eat prestige. They too signed on with the NewsGuild, and the unit was recognized by management in July, 2018. Most commentary on this wave of organizing noted that the educated, urban, hipster creatives flocking to unions were an unlikely source of energy for a labor movement on its heels. How could the free-wheeling, entrepreneurial ethic thought to characterize the digital media workplace be fertile ground for unionists? As it turned out, there was marginal resistance to the idea of unionizing in the first place, among the workers themselves, and with a few important exceptions where stock in trade union avoidance tactics were in play, amongst the corporate owners. Many of the sites that have been organized are run as progressive platforms, which would make trotting out those tactics a bit awkward. But the basic bread and butter gains of simple trade unionism—raises, consistent and transparent paths to promotion, and security—also were key in terms of leading media workers into the collective embrace of a union. As noted in “Connecting the Dots,” workers wanted jobs that were in line with an increasingly mature, profitable industry, rather than one bootstrapping for venture capital with workers paid on the promise of a big pay day down the road. Indeed, this active interest in unionization suggests that claims about the liberating qualities of an unscheduled, DIY, post-professional working life have little purchase amongst “creatives” over the longer run. While the actual numbers of workers joining unions is relatively small, the trend in the digital media world adds substance to polling data indicating an increasingly positive view of unions amongst the young. And judging by other developments since “Connecting the Dots” went to press, the article’s deeper narrative of political economic transformation in the industry remains key to understanding this current wave of organizing. The internet certainly did transform the way in which the public accessed news, commentary, and basic information, and it did radically undercut the traditional print media in the competition for advertising dollars. But workers in the world of print media, and especially in newspapers, had been on their heels well before the ascendency of the internet. As the late and one-time newspaper man Ben Bagdikian has documented since the early to mid-1970s, the built-in drive for monopoly power in the corporate news business was a main disrupter of newsrooms, and for that matter, composing rooms and pressrooms, of the analog age industrial media. Publishers played hardball with labor, all the while masking their class interests with warnings of impending financial doom and pieties about their duties as stewards of a free and independent press. The latest twist has been the entry of private equity firms and hedge funds into the ranks of press ownership, which has sparked notable resistance amongst news workers over the last several months. Take Alden Capital, which counts among its holdings the management company Digital First Media. The latter owns around 100 local and metro dailies, some in the Mid-West, but most in California, where it controls just about every decent sized paper except the Los Angeles Times and the San Francisco Chronicle. Thanks to the public protests of Guild represented journalists at Digital First Media papers, the tactics of the hedge fund are rapidly coming to light. Layoffs decimated papers in Southern California, and then papers in the Bay area. At the latter outlets, according to the Washington Post, headcounts in newsrooms have been slashed by more than one half since 2011. Then the axe fell at the venerable Denver Post in March, 2018, where Digital First Media managers laid off roughly one-third of the paper’s staff, despite a profitable year in 2017. The asset stripping ways of Alden Capital—already well known as a leading “vulture fund”—had brought matters to a head. In a Sunday edition, the Post’s editorial board devoted a series of ten Op-Ed pieces to documenting Alden’s misdeeds, characterizing them as an attack on the public mission of a newspaper. The “revolt” garnered wide attention. Nationally known industry analysts decried the arrival of vulture capitalism in the presumably public spirited newspaper business and the hole in local coverage it was creating. Bold journalists employed by Digital First Media tweeted ironic photos of Alden Capital honcho Heath Freeman’s new addition to his mansion in Montauk. In May, the NewsGuild helped bring workers from several Alden Capital papers to New York City to protest outside the fund’s midtown office. As a reporter from the East Bay Times told the Columbia Journalism Review, “we want Alden out of our news.” Just as important, the NewsGuild itself was leading the way in reporting Alden Capital’s assault and its consequences. In a blog called “Newsmatters: A Newsguild Project for Digital First Media Workers,” the Guild is providing what amounts to a corporate campaign anchored by solid, hard-nosed journalism. Led by reporter Julie Reynolds, the blog gives voice to affected workers, and tirelessly digs around for the dirt on Alden Capital. Indeed, it was because of Reynolds’ work on the dedicated NewsGuild blog that national outlets—the New York Times, the Washington Post, Bloomberg.com—ran not only with the basic story but the important point that it wasn’t simply the internet that was killing the news, but financial capital hell bent on fast profits. “Imagine if Gordon Gekko Bought News Empires,” went one headline on Bloomberg.com. What’s more, the blog’s coverage brought needed attention to academic research that extensively documents financial capital’s decimation of local newspapers country-wide. Late news out of New York suggests the urgency of the task. At the end of July at the Tronc owned Daily News, long the tabloid of the city’s working class and since 2016 the author of many front cover blasts aimed squarely at Trump, managers laid off some 50% of editorial staff. This will surely mean even less local coverage of a town whose newspapers once defined the city beat. Interesting times, then, for labor in the media industry, not least because a serious public issue—the vitality of the press—seems now to be intertwined with a labor issue. As noted in “Connecting the Dots,” the WGAE and the NewsGuild have been quiet about any organizing competition between them. It may be that the WGAE is proving more adept with “native” digital firms—which makes some sense, as many of those are hybrid news and entertainment operations, usually producing shorter and punchier material rather than “traditional” journalism. The one exception is the WGAE shop at The Intercept, an outlet which does do investigative reporting. For its part, the NewsGuild could be better positioned politically. As an ideal, the notion of democratic public sphere grounded by a watchdog press still runs pretty deep in the political culture. The NewsGuild’s historical and present-day role as a defender of independent journalism could therefore come in handy in terms of energizing other newsworkers and building coalitions in communities to help fight off the forces of “vulture” capital. Furthermore, as an affiliate of the Communications Workers of America (CWA), the NewsGuild has resources behind it. It also has potential allies in the thousands of CWA members who tend to various pieces of the physical and service infrastructure of the internet itself. As most of us now get our news through our phones, we mustn’t forget that these are newsworkers too, the pressmen, printers, mailers, and delivery drivers of the digital age. 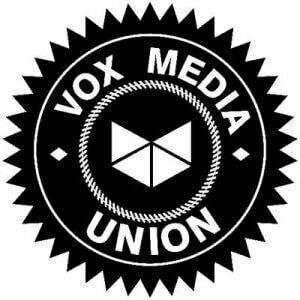 James Warren, “Vox Media Workers’ Union Move, Explained,” Poynter, May 2017. http://amp.poynter.org/news/vox-media-workers-union-move-explained. “Editorial Staff of The New Yorker Unionized The NewsGuild of New York,” June 6, 2018. http://www.nyguild.org/front-page-details/editorial-staff-of-the-new-yorker-unionizes-with-the-newsguild-of-new-york. Quoted in Josh Eidlelson, “Chicago Tribune Staff Seeks Union in Challenge to Tronc,” April 11, 2018. https://www.bloomberg.com/news/articles/2018-04-11/chicago-tribune-staff-seeks-to-form-union-in-challenge-to-tronc. The letter can be found at: http://www.newsguild.org/mediaguild3/wp-content/uploads/2018/05/Chicago-Tribune-Guild-Letter-to-Colleagues-re-Voluntary-Recognition-050618.pdf. Paul Farhi, “As a Secretive Hedge Fund Guts its Newspapers, Journalists are Fighting Back,” The Washington Post, April 18, 2018. https://www.washingtonpost.com/lifestyle/style/as-a-secretive-hedge-fund-guts-its-newspapers-journalists-are-fighting-back/2018/04/12/8926a45c-3c10-11e8-974f-aacd97698cef_story.html?noredirect=on&utm_term=.88b54b13da47. Meg Dalton, “A Unified Front against Alden Capital Makes its Way to New York,” Columbia Journalism Review, May 8, 2018. https://www.cjr.org/local_news/a-unified-front-against-alden-global-capital-makes-its-way-to-new-york.php. For Reynolds’ reporting, see https://dfmworkers.org/archives/. For her summary account of Alden Capital’s profiteering off its evisceration of local news, see “Meet the Vulture Capitalists Who Savaged the Denver Post,” The Nation, April 13, 2018. https://www.thenation.com/article/meet-the-vulture-capitalists-who-savaged-the-denver-post/. For a short video featuring impacted workers, see https://dfmworkers.org/new-video-dfm-workers-fight-to-save-local-news/. Joe Nocera, “Imagine if Gordon Gekko Bought News Empires,” Bloomberg Opinion, March 26, 2018. https://www.bloomberg.com/view/articles/2018-03-26/alden-global-capital-s-business-model-destroys-newspapers-for-little-gain. Nocera credits Reynold, and “highly recommends” her reporting. How Might We Teach the History of Labor Journalism? “The Labor Beat,” the new issue of Labor: Studies in Working-Class History guest-edited by Max Fraser and me, focuses on labor journalism’s past and present. This post suggests strategies and resources for teachers at high school or university level looking to use this special issue to bring the history of labor journalism alive for students.